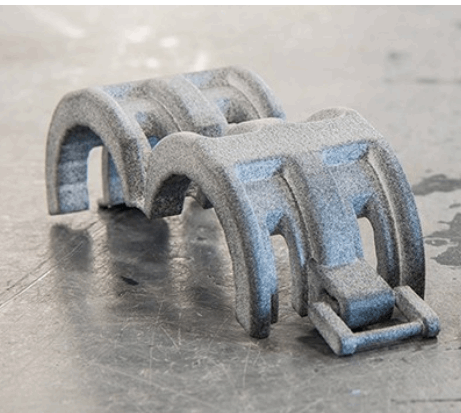 Proto Labs offers Multi Jet Fusion, a 3D printing process that uses commercial-grade unfilled Nylon 12 material to produce functional nylon prototypes and end-use production parts requiring consistent isotropic mechanical properties, and those with complex and organic geometries with fine features. Final production parts can be available in as fast as one day. The Multi Jet Fusion process utilizes an inkjet array to selectively apply fusing and detailing agents across a bed of nylon powder, which are then fused by heating elements into a solid layer. Powder is distributed on top of the bed after each layer, and the process continues until the part is created. When completed, the entire bed is moved to a processing station where the majority of loose powder is removed by an integrated vacuum. Parts are then blasted to remove any residual powder before dying the part black. For more information on Proto Labs’ Multi Jet Fusion capabilities and guidelines, visit the Proto Labs webpage.